The route to fascinating jazz biography. "Portrait of a Silk Thread"
Excerpts from the literature featuring Duke Ellington, Louis Armstrong, Fats Waller, Dave Brubeck, Lou Levy, Gerry Mulligan, Buddy Rich, Chu Berry, Harry James, Milt Hinton, Tommy Dorsey, Bix Beiderbecke, Mel Torme, Anita O'Day, Terry Gibbs, Benny Goodman, Cab Calloway, Woody Herman, Charlie Barnet, and Glenn Miller. 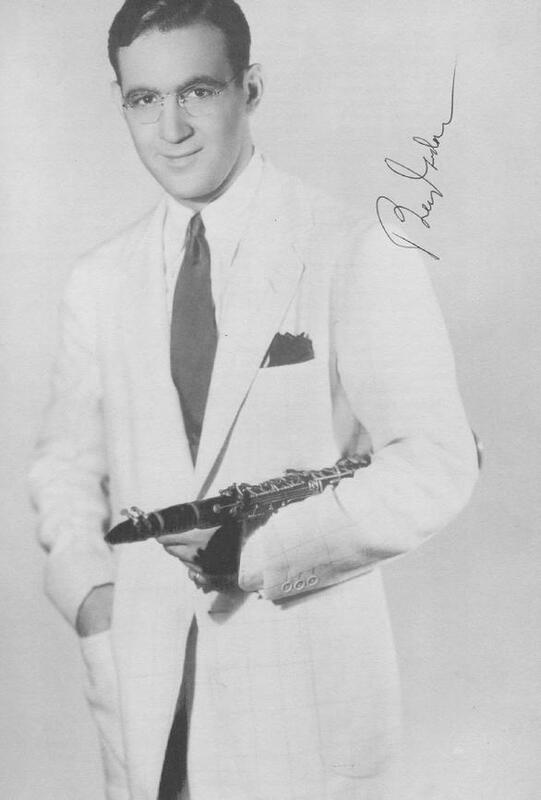 I met Benny Goodman when I was 17 at the stage door of the Valley Forge Music Fair in Pa. I had lugged George Simon's over-sized book "Simon Says: The Sights and Sounds of the Swing Era", with the ambition of getting his autograph. I left my seat while Benny played his last number, "Avalon" with a quartet which included Bucky Pizzarelli and Slam Stewart. I rounded the circular building in the dark parking lot, and noticed a single light over a door with a few steps leading down to the lot. I figured it was the stage door. Benny appeared a few minutes later. He was tall, wearing a long, light brown camel hair coat. He was making a hasty exit before the audience started towards their cars in the lot, possibly to get on the turnpikes back to NYC that Sunday night. I said "Hi", and told him he had been a very big influence in my life, would he please sign my book? I had book-marked a full-page 1936 picture of him standing in a white sports jacket, with clarinet studiously tucked under an arm, the other hand in jacket pocket. He studied the picture with interest, as if he hadn't seen it for a long time. He signed it, looked at the spine of the book, and leafed through the rest of the pages. I told him it was George Simon's latest book, and asked "You remember George, right? ", "Oh, sure I do. ", and that was it for smiles that evening. I also asked him if he could sign a smaller, more portable piece of white note paper- "To John, Benny Goodman", and I walked with him to his limousine across the lot. He was quiet. I asked him if I could carry his clarinet case for him, and he demurred, "No, that's okay, I've got it". I asked him why was the record "Popcorn Man" recalled on its day of issue in 1937 by RCA? He asked me, "What was on the other side of that disc?" I said I had the 1960 LP, so I wouldn't know. "Well, it was a problem with the other side". His driver opened the rear right limo door. Benny placed his clarinet case on the seat, then pushed it over a bit, and got in himself. I said, "Goodbye, it was nice to meet you Mr. Goodman". He said "You too, thanks, so long". I stood watching the tail lights get smaller and then they were gone, lost in the traffic of the entry ramp of the Pa. Turnpike. John Twomey created the first all day jazz "Tribute to Gene Krupa" on the Yonkers, N.Y. waterfront on July 4th, 1999, which featured many large and small bands, including the Gene Krupa Orchestra. He served as the website jazz editor at J&R Music World in N.Y.C., and authored the biography of Stan Getz featured on the official Stan Getz website, "The Sound".